Also known as St Mary's. 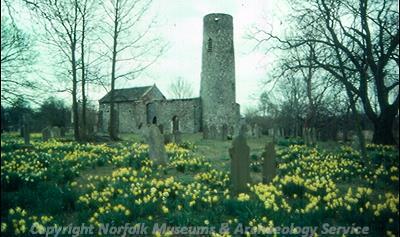 Ruined church, Late Saxon nave and possibly later Saxo Norman round tower. Extended about 1300 and in 15th century. 1931. Medieval sherds and tiles found. E. Rose, (NAU) 9 May 1990. This record is to accompany the proposal for repair and consolidation of the ruin and the memorial chapel. The site is adjacent to Hautbois Castle (See 7679) which was built in the ealy 14th century by Sir Robert Bainard. The site has 11th century north and west wall of nave with contemporay part of north wall of chancel. The battered round tower was an addition of early 12th century. Chancel extended and south transept added in early 13th century. This became the east end of a wide 14th century aisle, (clear change in fabric), with a 2-bay arcade. Ruinated at time of construction of replacement church in 1862 (see 7702). The chancel has an early 19th century king post roof with raking struts.The font with its complex interlace decoration has been moved to the new church. Very isolated site. S. Heywood (HES), 28 March 2013. --- Newspaper Article: 1979. Eastern Daily Press. 26 November. --- Publication: Corbishley, M.J.. 1982. AM107. --- Newspaper Article: 1990. Eastern Daily Press. 16 May. --- Archive: Heywood S. (HES). 2000. 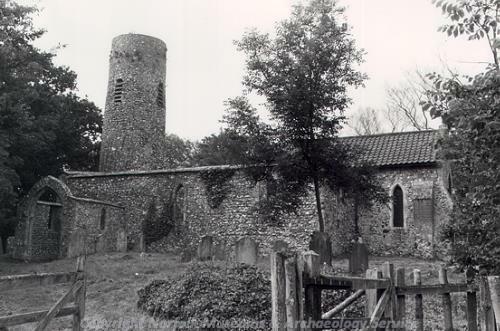 Norfolk County Council Site Visit Record - St Theobald's Church, Great Hautbois, Coltishall. <S4> Unpublished document: S.Heywood (HES). 2013. Building record of Church of St Theobald, Great Hautbois.